Welcome to 100 Black Men Of Greater Lafayette, Inc. Thank you for visiting the website of 100 Black Men of Greater Lafayette, Inc. 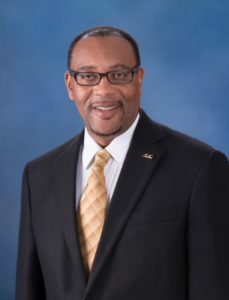 I invite you to take some time to learn more about 100 Black Men of Greater Lafayette, Inc. Established in 2008, we are a 501 (c) (3) non-profit organization. Our Mission is to improve the quality of life, enhance educational and economic opportunities for African Americans, particularly youth residing in the Greater Lafayette area. “Four for the Future” represents the core areas in which 100 Black Men of America and their 115 affiliate chapters delivers our programmatic initiatives. The “Four for the Future” programs are Education, Economic Empowerment, Health and Wellness, and Mentoring. We are an organization of committed and caring men dedicated to positively affect the quality of life in our community. Since 2008, we have mentored hundreds of youths at several schools in Lafayette Parish. We have collaborated with Evangeline Area Council Boys Scouts of America to revitalize scouting for under-served youth in north Lafayette. 100 Black men of Greater Lafayette became the chartering organization for Cub Scout “Pack 100”. Annually since 2009, we have partnered with Omega Psi Phi in hosting a “Kuts for Kids and Stuff a Back Pack” event wherein thousands of children have been provided free haircuts and school supplies. Since 2009, through our partnership with Our Lady of Lourdes Regional Medical Center, we have hosted Heath Fairs annually. In October 2017, we expanded our collaborations to include State Representative Vincent Pierre, S.M.I.L.E. Community Acton Agency. During the 2017 Health Fair 45 vendors were on hand to provide various health screenings and health education information to the community. In 2014, we began hosting a Fathers of the Year Awards Banquet in collaboration with Evangeline Area Boy Scout Council and Alpha Phi Alpha. The Awards Banquet has recognized over 200 fathers that have been nominated as a Father of the year. We have selected 12 Fathers with the high honor as a Father of the Year for being exemplary fathers, role models, and mentors to youth. This is a challenging time, but yet an exciting time as we continue to “Ignite” 100 Black Men of Greater Lafayette, Inc. as we move forward with increasing our chapter’s capacity to deliver impactful programs to our community and youth. We steadfastly believe in and value services that personify our national motto “What They See is What They’ll Be.” We are “Real Men, giving Real Time”. I hope that as you read and/or listen about the work of the 100 that you will be inspired to join us as a member, volunteer, or a donor. We welcome collaborations with other organizations in an effort to provide resources to our communities and make a positive impact on future generations. Again we thank you for taking the time to visit 100 Black Men of Greater Lafayette, Inc. website. We thank you for your support as we strive to inspire and positively impact the lives of the youth in our communities.